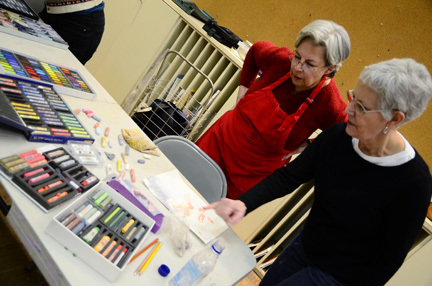 On Wednesday mornings a group of watercolor and pastel artists meet at the Capitol Hill Arts Workshop to create and share. This is a very serious and committed group of artists who continually challenge themselves both technically and conceptually. It is an honor to work with them and I look forward to our classes with enthusiasm. The group has been accepted for a residency at the Iona Wellness and Arts Center in Northwest Washington for the spring of 2017. The scope of an exhibit there–between 75 and 100 pieces of work spread out over a large campus is a little daunting, but also exciting. And we will have the opportunity to present workshops, lead plein air painting outings and other events during the course of the residency. We would like to record and share some of our preparations for this residency in this blog. I hope we can show how we strive, stumble, achieve and work together towards this goal. Spring 2017 seems far off, but I suspect it will be on us before we know it. This entry was posted on January 13, 2015 by ellen3c in Uncategorized and tagged Ellen Cornett, Introduction, Iona Wellness & Arts Center, Pastel, Residency, Watercolor.